CEMB ADAS CCD KIT allows positioning of the CCD sensors on any ADAS/ACC calibration structure by means of universal adapters and, through a very quick and simple software included in the alignment program, enables to facilitate the positioning. WHY?Before carrying out the calibrations of ADAS and ACC systems it is necessary to check alignment of the vehicle. Furthermore, following the possible variation of thrust axis due to adjustments, it is necessary to perform drive assistance systems calibrations. 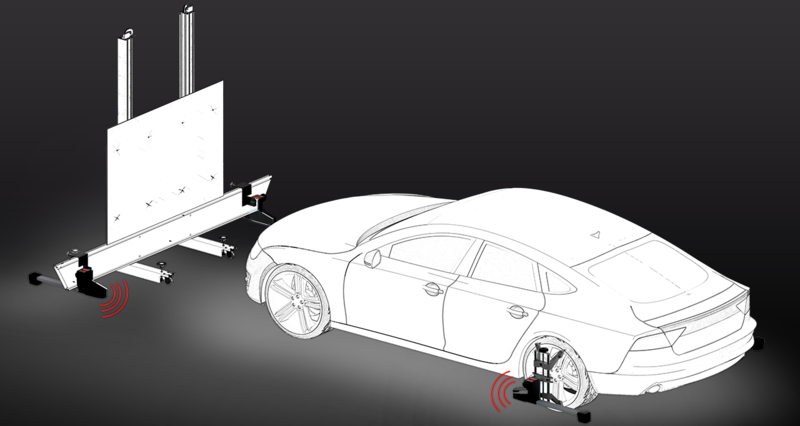 HOW DOES IT WORK?The CEMB ADAS CCD Kit represents the perfect package between wheel alignment system and efficiency in set up for the ADAS/ACC calibration panels. After having done the vehicle alignment, you position the front axle sensors on the ADAS support panel calibration bar by means of universal adaptors supplied with kit; leaving the rear axle sensors in their standard rear axle mounted location. With a simple key-press of the dedicated software program, and through an interactive sequence displayed on the monitor, the techniciaon is guided to quickly position the ADAS calibration support panel. After a few seconds, by means of an error-proof procedure, a perfect positioning of ADAS support panel is obtained in respect to the vehicle thrust angle (both perpindicularity and centering). ADAS CCD System by CEMB detects centering and inclination of the ADAS/CCD panels in respect to the thrust angle, showing results in degrees. The distance of the panels from the center wheel and their height depend by manufacturer specs, type of ADAS/ACC panels and diagnostic system utilized. WHAT ARE THE BENEFITS OF ADAS CCD KIT? QUICK >? The procedures to position ADAS/ACC calibration systems available on the market at the moment take quite e few minutes. This because it is necessary to carry out positioning respect to thrust axis and this requires a complex, lengthy and error prone procedure as the process for identification of thrust axis is completely manual. The CEMB CCD wheel alignment system identifies thrust axis instantly in a few seconds. This enables the CCD system to supply operator with a real-time indication of the relative position between thrust axis and ADAS/ACC calibration structure. COMPLETE >? Before calibrating any ADAS/ACC sensors it is necessary to check vehicle alignment. Why involve two separate systems? Why have to manually recalculate thrust axis? Why waste time on a lengthy and complex set up procedure? The CEMB CCD alignment system is a complete alignment system and the ADAS Kit enables interaction with any ADAS/ACC calibration structure available on the market.